Our pumps and valves lead the way on quality and versatility. And customers rely on us for services matched precisely to their needs – from engineering to our System Efficiency Service. Those services make us first choice in the pump and valve market. Lots of people can sell, but only experts provide the best advice. When our customers face complex tasks, we’re with them from Day One. Whether they want planning guidance, specially designed components or help with commissioning, they’ll discover lots of reasons to choose KSB. And they’ll also find plenty of scope for individual requirements in other areas. We produce a wide range of standard pumps and valves – carefully matched to customer needs with the ideal materials, hydraulic systems and drives for each application. And our modern automation products ensure the very best in reliability and efficient operation. Satisfied customers are our best reference. See for yourself. 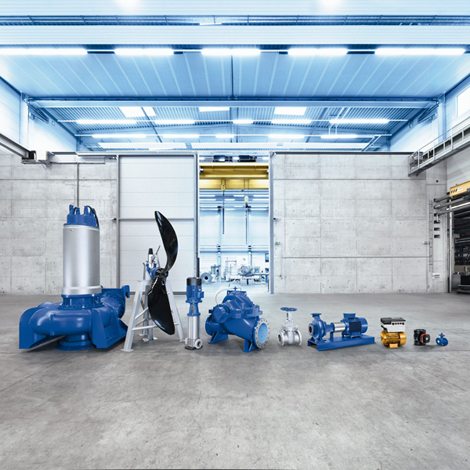 Pumps and valves from KSB are the flexible choice for a huge range of applications. Whether it’s industrial processes, water transport or energy conversion: all round the world, and for all sorts of tasks, customers rely on our technical skills and experience.